Sometimes when I drive the car somewhere I haven’t been by car for a while I have to mentally adjust the “map” inside my head so I can visualise which way I will be going by car as that trip is usually very different from the trip I would take by bike to the same destination. So when I have conversations with people around me who think that my riding to my local mega-suburban-shopping-centre is a risky, foolhardy act of great athletic prowess, it takes me a moment to realise that they are “seeing” a very different trip from the one I actually have. It take me five minutes to ride there, and that is all off road riding except for when I cross the road four times. I ride along the footpath for about a hundred metres, cross the railway line, then along a short shared path, then onto the offroad path shown above, which is like a laneway with fences and gardens on either side and is maybe a kilometre long. Birds sing and there are lovely flowers to look at. Then there is another shared path which is very wide and not heavily used and which is beside a wide busy road near the centre. I cross at a set of lights, then ride another 50 metres, cross the road at lights again and I am at the shopping centre. It is nearly flat the whole way. Once in the centre I ride for a few metres through the carpark, lock my bike at the bikerack near the doors and there I am. Five minutes, or maybe ten if the rail gates are down and the lights are not in my favour. So it does not really register with me why they would think that this trip is in any way dangerous or difficult. Until I think of the way I would have to drive there. It is a much longer trip by car, and there are several routes you can take. Two of them involve lots of traffic, traffic lights and multilane roundabouts that would daunt the most experienced of cyclists. The other one involves riding up a long and steep hill and then along the highway surrounded by six lanes of fast moving traffic. So if they are thinking that any of these ways is the way I would ride, then no wonder they think I am fit and foolhardy. I have decided it all comes down to the trip in your head. 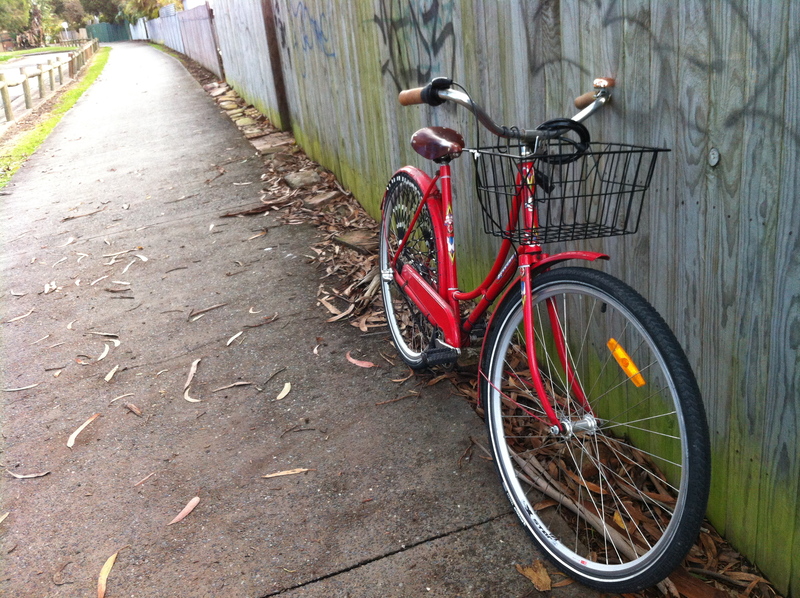 This entry was posted in Uncategorized and tagged Bike tracks, newcastle bike tracks, old bike, speedwell, vintage bike. Bookmark the permalink. Yes, very insightful. I often forget about that perspective.